Listen as Sai Maa shares about the Goddess Gaia Shakti sessions at the Kumbh Mela. 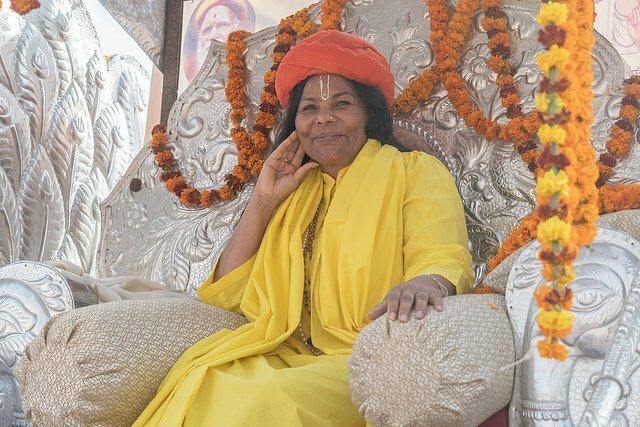 Hundreds of students of Her Holiness Sai Maa are traveling from many countries around the world and staying at Maa’s camp (shivir) during the entire time of the Kumbh Mela in Prayagraj (formerly Allahabad), India. Students are engaged in daily discipline and sadhana (spiritual practice), including meditation, chanting, puja ceremonies (Abhishek, Sai Maa and Krishna Aarti), yagyas (sacred fire ceremonies), and participation in Shahi Snaans (“big baths” where millions of gurus, sadhus (holy persons), international students, and local Indians move in procession to bathe in the holy waters of the river Ganga). For the very first time anywhere, Sai Maa is offering Goddess Gaia Shakti sessions during which Maa transmits to students the Shakti of Gaia, Mother Earth, coming through Maa, who is embodying this very high vibration energy. The students approach Maa individually, placing their hands on Maa’s legs or feet, taking in this new energy they have never experienced before with Maa. As Maa explains, Goddess Gaia agreed centuries ago to remain dormant due to the consciousness of past civilizations, and now in this Satya Yuga (era) she is awakening, ascending to a higher and higher frequency, requiring her inhabitants to also raise their vibration and consciousness. Maa teaches that all humans create an agreement with Mother Gaia when the soul incarnates into a physical body, and this relationship is crucial for the evolution of each person and the planet. Through these Goddess Gaia Shakti sessions, students now have a new energy and connection with Gaia that they can use in their lives. In embodying this energy of Goddess Gaia, with her deep love and compassion for her inhabitants, the students can now cooperate and co-create with Gaia, elevating the frequency of humanity and Mother Earth—both who are so closely intertwined, as their origin is the same source that is limitless and eternal.